Being a parent can be easily described as the hardest job on the plant. It can be even harder if there are financial limitations that restrict what you are able to provide. Therefore, it is important to have incomes from both parents to help properly support a child’s needs. Child support is key in order to provide the necessary financial support to raise a child. Child support can usually be established through a divorce or paternity suit. Georgia law requires the noncustodial parent to pay a reasonable amount of child support to the custodial parent to help support the child’s living expenses, health insurance, medical and dental expenses and more. The law in Georgia requires both parents to financially support their children until the child reaches the age of 18, graduates from high school, marries, dies, emancipates or joins the military. If the child reaches 18 and is still in high school, child support may still be required. Child support isn’t as simple to calculate at times because there are other factors that come into play to reach a reasonable amount. Currently, child support takes into account both salary incomes of the parents and any other sources of income. The number of children that are to receive child support is also taken into consideration. If either parent has previous child support obligations to other children, the calculation of child support will consider any ongoing child support obligations. 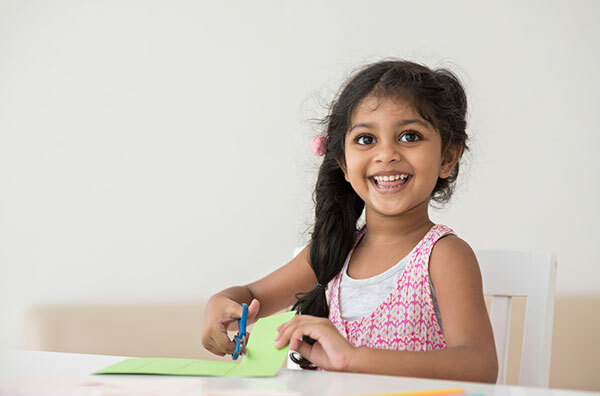 Once a standard amount has been established, the child support can be adjusted by factors such as health insurance premium cost for the children and work or education related childcare cost. 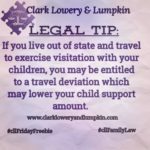 Deviations to child support can also be considered. There are usually upward and downward deviations such as parenting time, extraordinary medical expenses, travel expenses, tax credits and more that can affect the child support obligation. 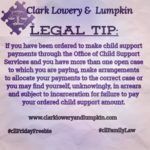 Georgia law provides various remedies to ensure child support obligations are met. When forming an agreement regarding child support, the obligor parent can agree to an Income Deduction Order. This will allow their child support payments to be deducted from their employment check. If a parent has failed to make their child support payments, you can file a petition for contempt with the order to order the noncustodial parent to pay what’s owed and possible attorney’s fees. Other remedies such as suspending the parent’s license and placing a lien on property owed can occur to ensure compliance with child support obligations. Like anything, child support isn’t permanent. If there are certain circumstances that warrant a change in child support payments, both parents can seek a modification. The general rule is that a party cannot seek a modification until two years after the final order. The noncustodial parent can seek a downward modification if their income has decreased and the custodial parent can seek an upward modification if the noncustodial parent’s income increases. If you are unable to make your court ordered child support payments, it is imperative to seek counsel and file a modification due to changed circumstances. It is possible to establish a verbal modification. However, this should be approached with caution because that agreement may not hold up in court if a contempt action is filed against you. There are other factors that could warrant a modification in child support such as change in the child’s needs, disability of a parent which disables their ability to work, change in custody, increased cost of child expenses and more. When seeking a modification, the party must establish that there is a substantial and continuing change that has affected the parent’s ability to make their child support payments. Child support can be a daunting task and very emotional. 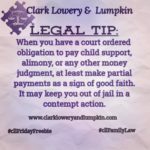 The attorneys at Clark, Lowery and Lumpkin can help establish a reasonable child support obligation and to ensure that your child is receiving the financial support they deserve.